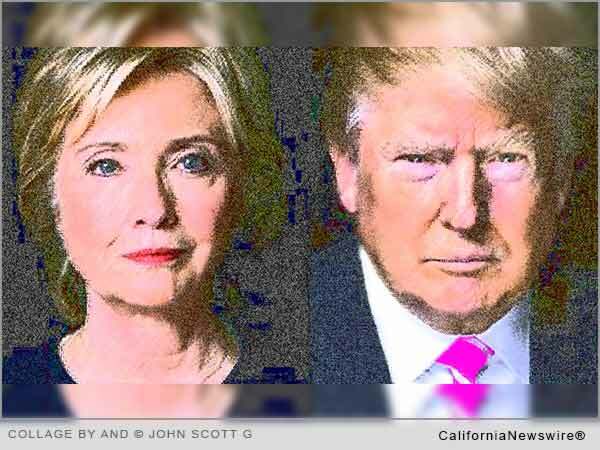 Home Articles: Political Opinion Opinion: Will the Ape Debate Hillary? Whether or not Donald Trump chickens out of debating Hillary Clinton, Americans are already judging the speeches, statements, and pronouncements of the sane candidate and the angry orange orangutan. The speaker was one of several self-identified independent voters at an informal gathering (read: party) held in Downey, a city located almost exactly midway between Los Angeles and Nutjobville (read: Orange County) in Southern California. “Why do you think Trump would turn tail and run?” the speaker was asked. Which got me to thinking about the disparity between the policy ideas of Hillary Clinton versus the “policy” “ideas” of “Donald Trump.” Here are just a few examples, and the contrast between the two candidates is instructive. . .
Hillary Clinton — Increase early childhood education and offer preschool for all 4-year-olds. Overall, strive to provide access to affordable childcare for every family. Hillary Clinton — Elevate the teaching profession, rebuild and refurbish classrooms, offer computer science for all students, and undo the school-to-prison pipeline. Hillary Clinton — Repair the Voting Rights Act and implement automatic voter registration to make it easier for everyone to vote. Hillary Clinton — Multimillionaires should pay their proper share of taxes. Close tax loopholes for corporations and Wall Street and lower tax burdens on small business. Hillary Clinton — Reform sentencing laws, end racial profiling, and increase interaction between police and the communities they serve. Hillary Clinton — Will pursue policies to reduce gun violence. Hillary Clinton — Seeks comprehensive immigration reform. Hillary Clinton — Wants to increase training, apprenticeships, and the building of 21st century skillsets for all workers. Seeks an increase in the minimum wage and strengthening rules about overtime pay. Hillary Clinton — Recognizes that the U.S. participation in the North Atlantic Treaty Organization is crucial to maintaining peace. Hillary Clinton — Understands that our nuclear arsenal is for deterrence. Two people on the way out of the party were discussing the campaign. The party broke up not long after that. Now if only the same can be said about the Republican Party.